Please stop by our booth on Saturday, September 7th to get your dogs microchips scanned. We can tell you if they are working, show you where they are located, and provide you with the brand and 1-800 number of the company so that you can call and check to make sure your information is up to date. If you can’t stop by Wagfest, please ask your veterinarian to do this at your next scheduled appointment. Many people have moved or dropped their landline telephone service and forget to update their microchip information. When microchip information is outdated, it is very hard and sometimes impossible to track down the owner of a dog. Keep your loved ones safe and make a microchip check part of your yearly routine! 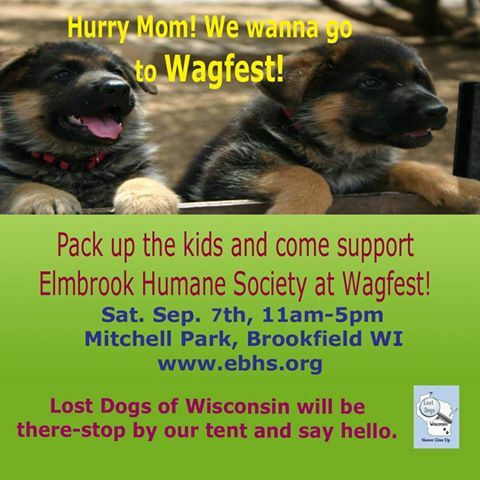 This entry was posted in Events, Our Organization and tagged Brookfield, events, Lost Dogs of Wisconsin, microchips, scanning, Wagfest, Waukesha. Bookmark the permalink.